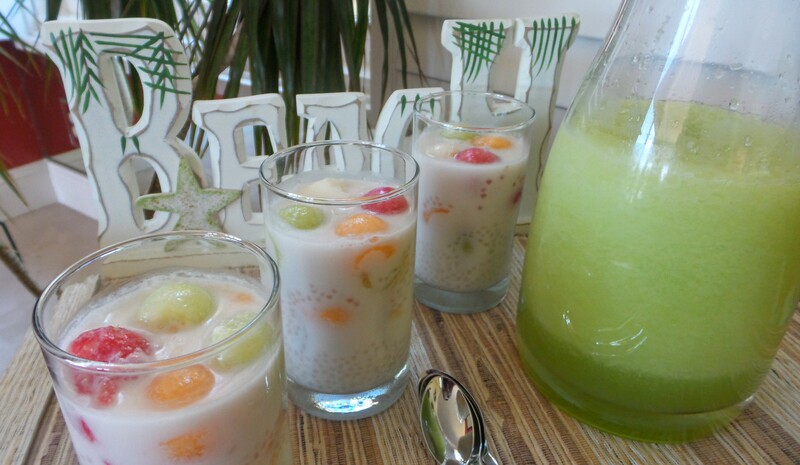 Sago, coconut milk, and melons. All my favorite ingredients in a nicely chilled dessert for a hot summer day BBQ! Scoop water melon, cantaloupe, and honeydew into balls using a melon baller. Set aside to chill in the refrigerator. Dissolve sugar in 250ml water. Add pine leaves and simmer the syrup for 10 mins. Remove pine leaves. Cook coconut milk and coconut water over moderate heat to scaling point. Keep stirring while cooking. Remove from heat and add salt and the syrup. Stir well. Allow to cool and chill in the refrigerator until ready to serve. Bring 10 cups of water to boil. Add sago and simmer for about 10 minutes. Turn off heat and cover the pot with the lid and let the sago continue to cook for another 10 minutes. The sago should turn translucent when ready. Drain the sago in a fine sieve and run cold water through it to remove excess starch. 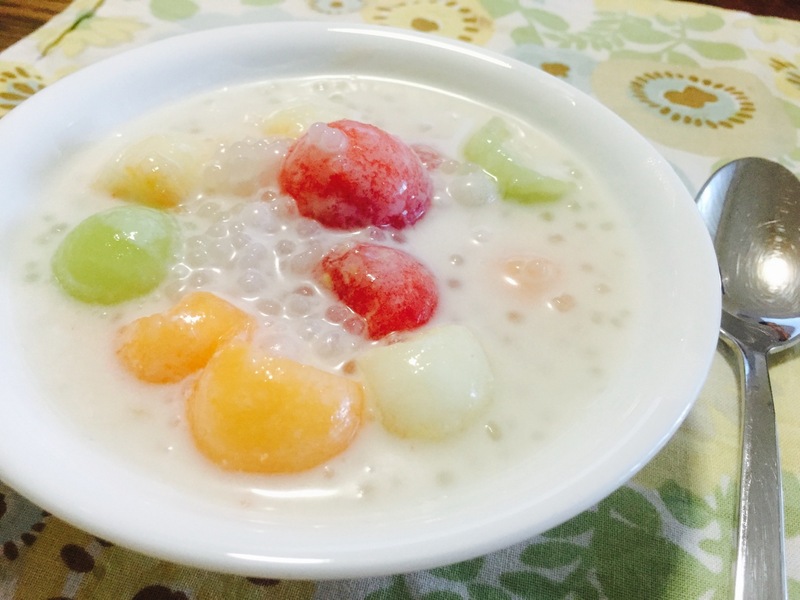 Soak the sago in cold water until ready to serve. 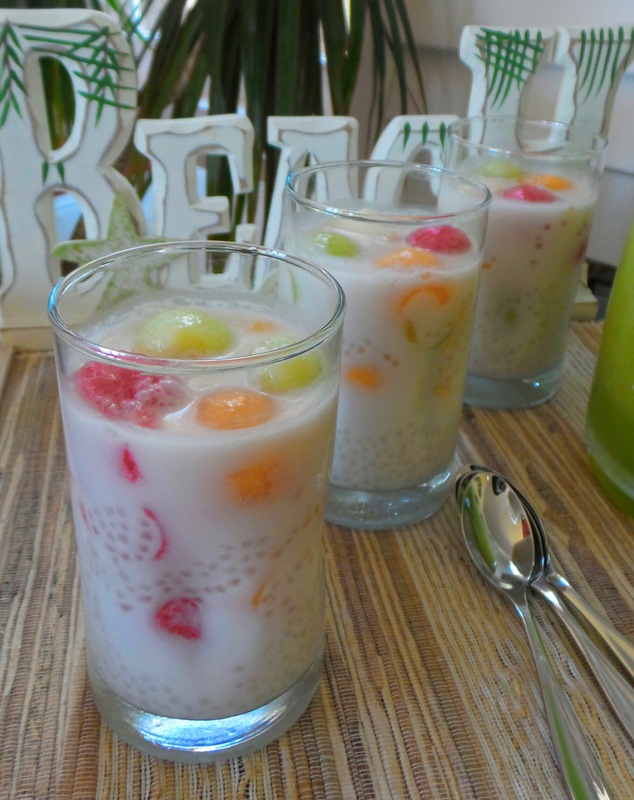 To serve, stir the sago in the coconut milk. Ladle into serving dish. Add the melon balls. Thank you. SG is a foodie paradise. Try the local dishes that are so uniquely Singaporean, like Chicken Rice, Chilli Crab, and many many more.